LOTS of good infor on projectcbd.org ima try and copy and paste as much as I can here, If anyone has any info/experiance on CBD please post here. Also any known high CBD strains. In the spring of 1998, the British government licensed a company called GW Pharmaceuticals to grow Cannabis and develop a precisely consistent plant extract for use in clinical trials. GW's co-founder Geoffrey Guy, MD, was convinced —and had convinced the Home Office— that by using CBD-rich plants, GW could produce a Cannabis-based medicine with little or no psychoactive effect. That summer Guy described his approach at a meetingof the International Cannabinoid Research Society. In addition to countering the psychoactivity of THC, Guy said, CBD conferred benefits of its own. Queen Victoria had used CBD-rich Cannabis for menstrual cramps. Indeed, animal studies suggest that CBD lessened anxiety and reduced the severity and frequency of seizures. It was assumed that generations of breeding for maximum THC had reduced CBD in California cannabis to trace levels. GW had gotten its CBD-rich strains by acquiring the genetic library of HortaPharm, a Dutch seed company run by American ex-pat naturalists, David Watson and Robert Clarke. Tod Mikuriya, MD, founder of the Society of Cannabis Clinicians, expressed hope that "our Burbanks in the hills" would have preserved or could develop CBD-rich strains if and when an analytic test lab began serving the medical Cannabis industry. As the years went by, more and more promising studies involving CBD were described at meetings of the ICRS, the International Association for Cannabinoid Medicine, and Patients Out of Time. California doctors kept abreast of the research and O'Shaughnessy's reported on it, but we were merely observers, not participants —until the fall of 2008, when Oakland's Steep Hill Laboratory began testing samples provided by Harborside Health Center. Approximately one in 750 samples of Cannabis being grown for medical use is turning out to be CBD-rich. (For data collection purposes, "CBD-rich" has been defined as 4% or more by dry weight.) Doctors and patients now have a unique opportunity to evaluate its effects. HOW DOES CBD COUNTER ANXIETY? A new study by Jose A. S. Crippa and a team of Brazilian investigators confirms that symptoms of Social Anxiety Disorder can be reduced by treatment with CBD —and identifies areas of the brain involved in the process. The paper by Crippa et al, "Neural basis of anxiolytic effects of cannabidiol in generalized social anxiety disorder: a preliminary report," was published online Sept. 9 in the Journal of Psychopharmacology. Ten men with severe Social Anxiety Disorder (SAD), ages 20 to 33, participated in the study, which was conducted at the University of Sao Paulo. Crystalline CBD from THC Pharm in Frankfurt was used. Prior to undergoing a neuroimaging procedure to measure blood flow in the brain, the subjects were given either 400 mg of CBD dissolved in corn oil and packed in a gel cap, or a placebo gel cap. A week later they were given the alternative treatment. The investigators assumed that the neuroimaging —Single Photon Emission Computed Tomography (SPECT), which involves insertion of an intravenous tube and observation by a technician deploying a high-tech apparatus— was in itself an anxiety-producing event. Subjects recorded their anxiety levels before, during, and after the neuroimaging by means of a "Visual Analogue Mood Scale (VAMS)." The researchers were able to correlate these subjective reports with blood-flow activity measured in the brain. "CBD was associated with significantly decreased anxiety," they concluded. They observed reduced radioactive tracer intake in the left parahippocampal gyrus, the hippocampus, and the inferior temporal gyrus. They saw increased uptake in the right posterior cingulated gyrus. "These results suggest that CBD reduces anxiety in SAD and that this is related to its effects on activity in limbic and paralimbic brain areas," according to Crippa. If CBD-rich Cannabis exerts similar effects, Crippa's findings suggest that it can be useful in decreasing anxiety. Barriers between pro-Cannabis MDs and the medical establishment are falling. Doctors who monitor cannabis use by patients were bursting with questions yesterday during a talk by Sean McAllister, PhD, who has been studying the anti-cancer effects of cannabinoids in the laboratory (on a grant from NIH and with a license from the DEA). The occasion was the winter meeting of the Society of Cannabis Clinicians. "That's a very good question," McAllister would say, and provide the answer, and tie it back into his main thread. Dr. McAllister and colleagues at the California Pacific Medical Center Research Institute have discovered that CBD (Cannabidiol) is a very potent inhibitor of breast cancer. They have reported findings on the cumulative effect of CBD and THC in blocking proliferation of brain-cancer cells, and on CBD's mechanism of action in blocking breast-cancer metastasis. A new study by McAllister et al in the Journal of Breast Cancer Research and Treatment is an in-depth look at how CBD kills breast cancer cells in an animal model. CBD affects a protein called ID-1, which appears to be a major conductor of cancer cells. ID-1 is thus is an excellent target for a cancer treatment. Invasion Assay When cancer spreads it can eat through tissue (the process is called "metastasis"). CBD appears to inhibit the cells' aggressive behavior. The image above is from an experiment by McAllister testing how CBD can stop the invasion of cancer cells. The cancer cells are placed on a gel which contain small holes. The cells are dosed with a drug and after a few days you can count the number of cells that have made it through. This simulates what a tumor does as it eats its way through human tissues. The little black triangles are the cells. You can see that only a half-dozen or so made it through the gel when dosed with CBD (on the right). The control on the left shows that in the absence of CBD, the cancer cells easily chew through the gel. McAllister and colleagues at California Pacific have posted a video showing cannabinoids selectively killing cancer cells. The title of a paper published in Neuropsychopharmacology earlier this year —"Cannabidiol Attenuates the Appetitive Effects of Delta(9)-Tetrahydrocannabinol in Humans Smoking Their Chosen Cannabis"— suggests to us that CBD-rich Cannabis might work as an appetite suppressant. The authors, Celia Morgan and colleagues from University College London, tested 94 subjects on two occasions. The subjects smoked their own Cannabis and "while acutely under the influence" were offered more Cannabis, other drugs, and food. Morgan et al measured the eagerness with which the subjects responded to the offerings, and found that it correlated inversely with the CBD-to-THC ratio of the Cannabis the subjects were smoking. In other words, the higher the proportion of CBD they had ingested, the less desirous they became of more drugs and food. In the great Prohibitionist tradition, Morgan et al concluded that "CBD has potential as a treatment for Cannabis dependence" and " ossibly… for other addictive disorders." Here's the abstract: "Worldwide Cannabis dependence is increasing, as is the concentration of Δ9-tetrahydrocannabinol (THC) in street Cannabis. At the same time, the concentration of the second most abundant cannabinoid in street Cannabis, cannabidiol (CBD), is decreasing. These two cannabinoids have opposing effects both pharmacologically and behaviorally when administered in the laboratory. No research has yet examined how the ratio of these constituents impacts on the appetitive/reinforcing effects of Cannabis in humans. A total of 94 Cannabis users were tested 7 days apart, once while non-intoxicated and once while acutely under the influence of their own chosen smoked Cannabis on dependence-related measures. Using an unprecedented methodology, a sample of Cannabis (as well as saliva) was collected from each user and analyzed for levels of cannabinoids. On the basis of CBD : THC ratios in the Cannabis, individuals from the top and bottom tertiles were directly compared on indices of the reinforcing effects of drugs, explicit liking, and implicit attentional bias to drug stimuli. When intoxicated, smokers of high CBD : THC strains showed reduced attentional bias to drug and food stimuli compared with smokers of low CBD : THC. Those smoking higher CBD : THC strains also showed lower self-rated liking of Cannabis stimuli on both test days. Our findings suggest that CBD has potential as a treatment for Cannabis dependence. The acute modulation of the incentive salience of drug cues by CBD may possibly generalize to a treatment for other addictive disorders." We'll look into the appetite-suppressant angle here at Project CBD…In animal studies another compound in the Cannabis plant, THC-V, has been found to suppress food cravings. Nancy Sajben, MD, has shared a note from a patient about a CBD-rich strain purchased at Harborside Health Center (after he couldn’t find any CBD-rich Cannabis in Southern California). Dr. Sajben wanted to know whether heating Cannabis would indeed remove THC. Project CBD explains: “Just a few comments on the concept of increasing CBD over THC —I am afraid that this is not rational. Firstly, you can’t create CBD when it’s not there to begin with. There are a lot of crazy misconceptions floating around along the lines of raw Cannabis has more CBD; that heating turns THC into CBD; or that you can differentially favor one over the other. None of these are true. The amount of CBD in a given chemotype is genetically determined, period. Generally speaking, drug strains of Cannabis available in North America rarely have any significant amount of CBD. “THC has a boiling point of 157 Celsius, with CBD listed as 160-180 Celsius. However, both begin to sublimate off at even lower temperatures, and commercially available vaporizers, even the Volcano, do not heat evenly enough to allow fractionation of one component over another. What your patient is doing is wasting some cannabinoids and terpenoids by preheating. To get all of them out requires more prolonged heating, or a higher temperature. When the latter is done, it favors higher molecular weight sesquiterpenoids, many of which are sedating. That would account for the hypnotic effect along with whatever residual THC is left. Contrary to popular belief, CBD is actually alerting, except at exceptionally high doses. References: “A Tale of Two Cannabinoids: The Therapeutic Rationale for Combining Tetrahydrocannabinol and Cannabidiol” by Ethan Russo and Geoffrey W. Guy, and “Effect of D-9-Tetrahydrocannabinol and Cannabidiol on Nocturnal Sleep and Early-Morning Behavior in Young Adults" by Anthony N. Nicholson, Claire Turner, Barbara M. Stone and Philip J. Robson. From a reader: Conventional meds have not prevented our son from having seizures. He has been given a remarkable Cannabis concentrate —17% THC, 16% CBD— and wants to make cookies. His plan —which his neurologist is aware of— is to take a single-dose cookie when he wakes up and every four hours thereafter until he goes to bed, to maintain roughly even cannabinoid levels. He wants to find the dose at which he can be functional and seizure-free. He will titrate, of course, but what should the starting point be —how many miligrams of THC and CBD should that cookie contain? Reply from Janet Weiss, MD: Two options: If using the dronabinol dosing model as a starting point (30-90 mg), then an ingested dose would be 15 mg per cookie, consuming 6 cookies per day. Assumes that 50% of the cannabinoid content is destroyed in cooking or otherwise is not bioavailable, I would start with a recipe that results in 30 mg of cannabinoids per cookie in the batter. If using the Sativex dosing model (2.7 mg THC/2.5 mg CBD) per spray, 5-12 sprays/day (which assumes no destruction from cooking and 80% mucosal bioavailability), then 13.9 mg. is a dose. Since GI bioavailability is less than mucosal, I again come up with an ingested dose of 15 mg per cookie. (And suggest starting with 30 mg. cannabinoids per cookie in the batter). That's my 2 cents. There were two very interesting presentations at the 2010 ICRS conference in Lund, Sweden, relevant to dosing questions. • Yosef Sarne, an Israeli scientist, reported that ultra-low doses of THC had long-lasting effects “on cognitive functioning in mice.” Homeopathy! • Jacqueline Blankman from the Scripps Institute in San Diego reported on a powerful new compound that inhibits MAGL, the main enzyme that breaks down 2-AG. But it did this so effectively that 2-AG levels skyrocketed and her team observed the opposite reactions of everything they had expected –pro-inflammatory rather than anti-inflammatory, etc. At the same time, anandamide levels decrease when 2-AG levels are high (and vice versa), thereby accentuating the biphasic experience. Two years ago one analytic chemistry lab had begun testing Cannabis buds for potency in California, and one strain had been found to contain more than 4% Cannabidiol (CBD) by weight. 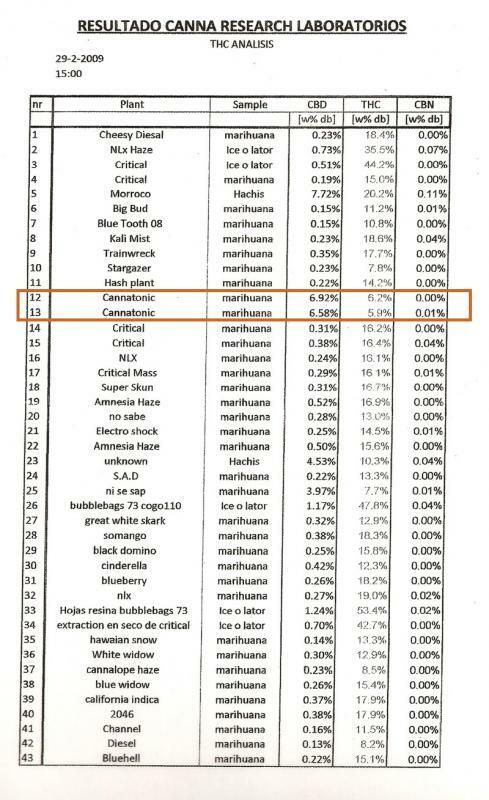 Today there are at least 10 labs serving the industry in CA, Colorado, and Montana, and more than 25 CBD-rich strains have been identified (See list at right). Dedicated plant breeders aspire to produce strains stable enough to enable seed sales. As one skilled breeder reminds us, "stabilizing the genetics... is not just a simple F1 Hybrid between two parents that may or may not have the desired traits. 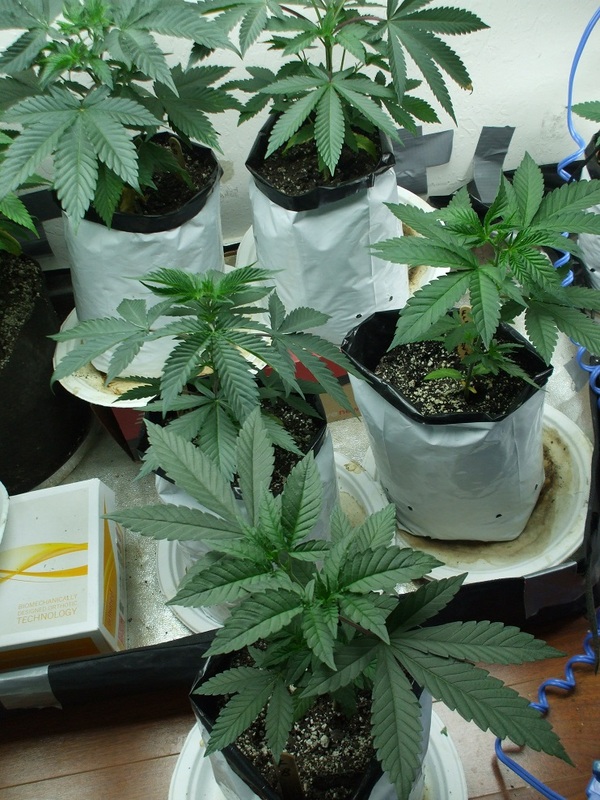 Stabilization could take as many as five or six inbred generations beyond the original F1 cross to establish a homozygous gene condition for CBD." We asked the dean of West Coast plant breeders, DJ Short, to define his standard of stability. "If you cross it with itself, you get pretty much the same thing," he replied. DJ guarantees that at least 2 females (and 2 males) in your pack of 10 will display or exceed the advertised characteristics. That means half the seeds, based on an 80% sprout rate. DJ says he could cross more generations and approach 100% replicability, but he knows the buyers would rather have access now, on the two-out-of-10 basis. Lawrence Ringo of Southern Humboldt Seed Collective informs us that he has stabilized the CBD-rich Sour Tsunami strain and will make seeds available as of March 1! Given the huge potential market for less psychoactive and non-psychoactive Cannabis, the introduction of CBD-rich medicine at the dispensary level can be seen as rather slow. Many dispensary owners have been reluctant to stock CBD-rich strains because their present customers are seeking —or are not adverse to— Cannabis that provides euphoria or sedation. In other words, THC content sells, it's a sure thing. Why should a dispensary spend money and devote shelf space to a type of Cannabis that most medical users haven't heard of and whose effects are unproven? Growers, in turn, have to anticipate the wants of dispensary buyers, and are reluctant to devote precious garden space to plants for which there is no established market. Demand at the dispensary level might not take off until effectiveness is established. Which might not happen until significant numbers of patients have tried CBD-rich Cannabis and taken the SCC survey to report their results. Why the Occasional CBD-rich Strain? Why does it happen, that after generations of breeding Cannabis to maximize THC, about one in 500 samples tested by the labs is found to contain 4% CBD or more? This is one of many questions we hope to answer. A friend is convinced that a mutation gave rise to his True Blueberry x OG Kush cross, which typically contains 10% CBD or more. "Neither parent stock had CBD," he notes. It took a series of crosses and parent selections to produce his blue-ribbon strain. When and where would such a mutation occur? As the Cannabis plant matures, the common precursor to both CBD and THC is a molecule called cannabigerolic acid (CBGA). CBGA is turned into CBD acid and THC acid by enzymes called CBDA synthase and THCA synthase. A mutation resulting in excess CBDA synthase or deficient THCA synthase would result in CBD-rich offspring. We hope to track the similarities and differences reported between strains with similar cannabinoid ratios. Harlequin, Jamaican Lion and Omrita Rx3, for example, have been tested several times by several labs and are in the neighborhood of 8-9% CBD and 5.5-6% THC —about a 3:2 ratio. And yet anecdotal evidence suggests differing effects. We have only taken the first step on a long march towards understanding. The emerging significance of cannabis components other than THC was again a prominent theme when the International Association of Cannabis as Medicine met in Cologne in early Oc-tober, 2007. The IACM was founded in199W by Franjo Grotenhermen, MD (as the German ACM); it is a smaller organization than the ICRS and its focus is more clinical, less pharmacological. “There is a fantastic collaboration between Arabs and Jews in smuggling,” Mechoulam observed. At the IACM meeting: Mechoulam and Christian Steup,director of THC-Pharm, a Frankfurt chemical company that synthesizes CBD for clinical and research purposes. to a recently discovered receptor called GPR-55 to which THC and 2-AG bind as agonists. It blocks the uptake of adenosine,an inhibitory neurotransmitter that may promote sleep. It blocks the formation of various cytokines (signaling com-pounds not released by nerves or glands)under certain circumstancs. It activates the serotonin receptors. No wonder,then, that CBD plays a role in many clini-cal conditions. Mechoulam described an experiment led by Paul Consroe and colleagues in Brazil in which CBD was tested as a treatment for intractable epilepsy. Patients stayed on the anti-convulsants they had been on (which hadn’t eliminated their seizures) and added 200mg/day of CBD or a placebo. Of the seven patients getting CBD over the course of severalmonths, only one showed no improve-ment; three became seizure-free; one experienced only one or two seizures, Mechoulam recalled; and two experienced reduced severity and occurrenc eof seizures. So it seemed a very promising approach,” said Mechoulam, “but unfortunately, nothing has been done ever since. To the best of my knowledge, no-body has done any work on cannabidiol in the clinic on epilepsy, and I just won-der why.”A colleague of Mechoulam’s, Marc Feldman at Imperial College, London,tested CBD on mice who had a version of rheumatoid arthritis and found that itr educed inflammation by almost 50% at the right dose —5mg/kg of body weight.But this “beautiful anti-inflammatory re-action was lost if we went up to, say, 25mg/kg,” Mechoulam said. Drug developers must bear in mind and cope with the fact that cannabinoids have a finite“therapeutic window” —they are ineffective at low and high doses. Mechoulam has been testing CBD on mice bred to have a version of type-1diabetes that manifests around age 14weeks. He and his co-workers treated these mice with CBD for their first 6-7weeks of life, then tested them 6-7 weeks later and found that only 30% had de-veloped diabetes (compared to 90-100%given placebo). CBD did not just prevent on-set but blocked development of diabetes. I am all about the CBD, because i have/have had at least six of the conditions listed. I wish I had known about indica medbud when I was having migraines. So it seems to me i will need to do some work to find the highest cbd's in this strain. Looks like some cloning and smoking to know what we have here... We are early into this research and these high cbd strains are sold out.... I think it is up to the grower to find the high cbd pheno in this plant. They aren't finishing the research before they sell these genetics because parents are desperate to find something for their child who is having seizures or what ever the conditions. is this old info or a recent post ozzy? delving into the CBD strains myself now,. but don't really have much info to share that's not already known. - i just hope we don't have a bunch of profiteers trying to cash in on its popularity, as those who seek thee strains, usually NEED these strains. This was info I found awhile back and posted at MP original post date was 5/31/2012 and made a sticky there. I copied it here when I was told MP was closing so that at least all the info in the stickies there would still be available to ppl to use. A non-psychoactive chemical found in marijuana called cannabidiol (CBD) could offer an effective treatment for brain cancer and is potentially an effective anti-cancer drug in the management of gliomas, without side effects, according to a new study from a team of Investigators in Spain, Italy and Canada. The results suggest that CBD helps battle brain cancer through a combination of anti-cancer effects at the molecular level. The researchers have summarized their findings on the effects of CBDs, ranging from triggering tumor cell death (apoptosis) to interfering with tumor blood supply (angiogenesis) associated with tumor growth in their latest report. While marijuana’s cancer-fighting potential is well documented, this study that involved conducting experiments using CBD and glioma cell cultures shows the effect of this cannabinoid on multiple tumoral features and molecular pathways. It also provides new insights into the antitumor action of CBD and the molecular mechanisms it influences. Strong pre-clinical evidence shows that CBD effectively limits human glioma cell growth (both in vitro and in vivo) by inhibiting the LOX (lipoxygenase) pathway, modulating the endocannabinoid system, and triggering oxidative stress and apoptosis. *don't know how links are accepted here. did hxxp, but was still live,so i'll leave it. « anyone know how to post pics from my android smartphone?